Former ConAgra CEO, Charles M. “Mike” Harper, received the Notre Dame Person of the Year award at the 2011 UND night on June 9. Harper, a former South Bend resident and retired CEO of ConAgra, received the award for his dedication and support of the University.Most recently, his foundation’s $10 million gift, along with a matching $10 million appropriation from the state of Indiana, helped establish the Mike and Josie Harper Cancer Research Institute. Located on the corner of Angela Boulevard and Notre Dame Avenue, the Institute is a joint collaboration between Notre Dame and the IU School of Medicine. After receiving the award, Harper reflected on the significance of the private and public partnership between Notre Dame and the State of Indiana and the memory of his wife Josie, who died of cancer. Harper praised her amazing support and the outstanding job she did raising their children, who help run the Harper Family Foundation. He also commented on the importance of encouraging public institutions to work together with private institutions, a centerpiece of the gift to establish the Cancer Research Institute. The Person of the Year presentation was followed by the featured speaker, Notre Dame Business School professor, Carl Ackerman. Ackerman has been recognized many times over for his outstanding teaching and support for students. 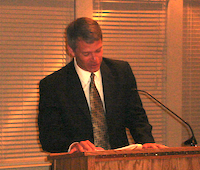 During his presentation, Ackerman showed several photos of students reading their Finance textbooks in interesting locales (underwater, while snowboarding, in the air) – an homage to his message that they should “always read their Finance books.” He offered several more stories of his interactions with Notre Dame students, commenting that they were always considerate and grateful for recommendation letters and phone calls that helped them jump start their careers. Ackerman noted that ND students are consistently personable and humble. The evening’s events were attended by over 70 alumni, friends, and representatives of the University. This year also featured ayoung alumni table that included a number of recent graduates.If you are interested in helping with future club events contact club president, Ed Murphy at efm1@cox.net.